This article was written for the 21cryptos' magazine's first edition. If you liked this article, make sure to visit www.21cryptos.com or reach out to their Twitter account to find out more! As a promotion for their first edition, the magazine is going at only $10 $5! Without further ado, let's get straight into the article! Prior to trading, I played poker actively for about 6 years. When starting out and after two years of paying tuition fees, a turning point for me was when I read Dusty Schmidt’s Treat Your Poker Like A Business, that helped transition my mindset and game from one of taking uninformed gambles to taking systematic and calculated risks. Once I started trading, I quickly realized that many of the lessons picked up from the tables were directly applicable, familiar concepts such as bankroll management, tilt, and positive expected value, come to mind. In this article, we’ll go through 5 key concepts, explain how they are related to trading, and what we can learn from them to become better traders. The term bankroll management in poker refers to the same risk management concept in trading. Just like how professional poker players compete at a stake where their bankroll covers at least 100 buy-ins, professional traders typically risk no more than 1% per trade. This is only a general guideline, as more aggressive players may play with just 20 buy-ins, or a trader risking up to 5% a trade. Trading cryptocurrencies come with a high degree of exchange risk. Your capital is your inventory, and there's a huge risk not only in losing your money, but also your time invested if the site you're on shuts down tomorrow. Keep you money with reputable exchanges, spread it out over various locations, and never invest more than you can afford to lose! Variance is basically that which deviates from the norm, be it good or bad. And this is where the concept of expected value comes into the picture. Short term variance is part of the game, and it is important to understand that trading is a marathon, not a sprint. The difference between gamblers and professional poker players or traders, is that the latter focus on the outcome of playing the long game. To avoid being a gambler, one must make trades that have a positive expected value. Do you know the expected value of the trades you make in the market? To really understand what are your odds of making a profit, and the expected size of that profit, requires establishing a set of rules and testing those rules over a large number of trades so you can determine the expected value of your strategy rules. 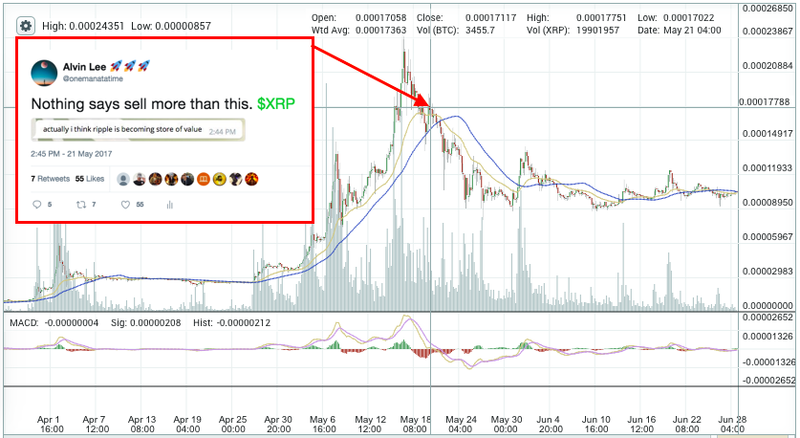 You may want to buy any coin that has strong fundamentals and a market capitalization of $10m or less, or one that has retested the 200 MA support. Sounds like a good idea, but is it? Only testing that rule over many trading examples and market conditions can really tell you if this simple approach to the market is an effective one. Strategies do not have to be complicated. They do need to be well tested! If you approach the market without a set of trading rules and an understanding of the expected value of your trading approach, you are a gambler. Yes, you will get lucky and could make great profits. However, in the long run, the profits of the gambling trader are just short term loans. If you have a mindset that you must move up [in stakes] quickly, trade a large size, risk a large amount, and manage your bankroll liberally, you’re setting yourself up for a really big mistake in the long run. That is a gambler’s mentality with which few people can succeed long term. I look at trading not as a gamble, but as a skill. I want to make a small business out of that skill, and like most businesses, I don’t want to risk having to close up shop. Staying open is the goal first and foremost; maximizing profit is second. To find an edge in poker is to understand who the fishes are at the table. From the Rounders movie, "listen, here's the thing. If you can't spot the sucker in your first half hour at the table, then you ARE the sucker." Also, having an edge means to play hands with positive expectancy, knowing when you have a better hand than your opponent and maximizing your profit, while minimizing losses when behind. In trading, this is akin to first understanding the general market conditions, then taking trades with positive expectancy, that is, trades that stand to win more than they lose over the long term, so that you make more in your winning trades than lose in your losers. A common mistake new traders make is in being myopic about technical analysis, without factoring critical overarching concepts such as the general market conditions, market cycles, trader psychology, and risk management. Why sit at a table with 8 sharks? If general market conditions are not favourable, don’t take the trade. In poker, you typically play less than 15% of your hands in a full ring table. Similarly, in trading, sit out when you don’t have an edge. Traders who have played poker should be familiar with something called “going on tilt.” In the poker world, this refers to a state of psychological or emotional frustration or confusion that causes the player to start making decisions that are less than ideal. Usually, this means adopting overly aggressive strategies that are unlikely to work, and which the player would never use in a more psychologically sound state of mind. Poker players usually go on tilt because they are frustrated with their own mistakes, with bad luck, or with other players. Does that sound familiar? If we are not emotionally prepared for the possibility of losing, we are more likely to be thrown by losses. We set ourselves up for the tilt state by needing and expecting to win, rather than letting probabilities play themselves out and accept that there will be winning and losing periods. Emotional control can also be improved by understanding probability and variance, and setting long term monetary goals instead of short term ones. Respect your risk management plan, and lose your ego. When you know you are on tilt or off your A game, the faster you get off the tables (or stop trading for the day), the more money you will save in the long run. There is a multitude of lessons that traders can learn from professional poker players, since both involve similar characteristics of incentive, risk taking, strategy, probability, emotions, psychology, and mental discipline. Success is determined not so much as which strategy but the determination and discipline by the trader to carry out the plan. At the end of the day, be careful not to treat trading like gambling. Remember, trading is a business more than anything! This article was written for the 21cryptos' magazine's first edition. If you liked this article, make sure to visit www.21cryptos.com or their Twitter account, to purchase their first article at an affordable price of only $10 $5, and enjoy over 50 pages of cryptocurrecy market insights, analysis, and articles. 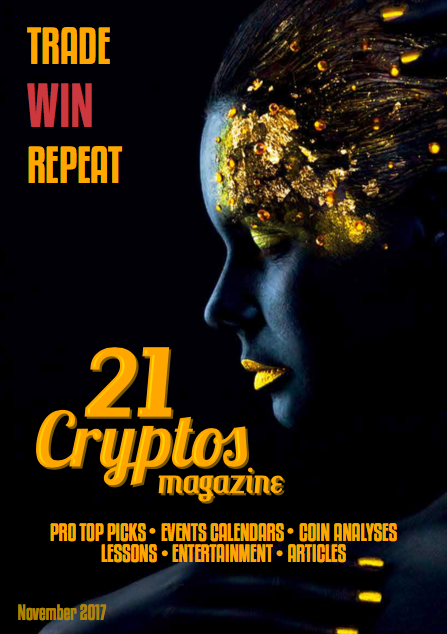 Also make sure to look out for future editions as I continue to be a guest writer for 21cryptos. Since I can remember, I haven't lived with my dad. I barely meet him since he worked overseas for the most part, and never knew much about him. Funnily enough, I never knew he traded financial markets, until after I got into trading and brought it up with him. Recently, I asked my dad to write a short introduction to trading, something that would be useful for people starting out and dipping their toes into trading financial markets or cryptocurrencies. Even though he doesn't trade Bitcoin or cryptocurrencies (yet), he's had decades of experience navigating the markets, and I hope this short and simple post can give you some insight into what an old-timer has to say about becoming profitable at trading. I have been trading in the “futures market” similar to what we now refer to as the Exchange-Traded Funds (ETF) market for the last 30 years. I would like to share my experience and knowledge with people that are interested in financial trading (*this is a short introduction and not meant to be a recommendation of any trade that anyone might like to take). A trader need first to decide the amount that he is prepared to invest or the amount that he is willing to cut loss in each trade and his overall trading. One must be disciplined with this decision making and necessary control action is very important. Unnecessary losses usually occur when one overtrades, or holds on to a position that had a big loss for too long that eventually that he cannot afford. 1. Trader needs to spend time to analyze and decide on a particular trade. 2. Trader needs to decide if short term or long term trading that he/she will like to be working on. Not spending enough time to understand the market that you are trading can result in unnecessary trading losses. There are much to learn in trading such as margin requirement, historical high and low level, economic fundamental of the product, average cycle period of high and low, stop order, technical analysis, trading hours, daily swap value of the product, etc. Target refers to both sides of your exit point on either profit taking or cut loss. A successful trader is more likely to be a person who is very disciplined in his execution of trade. Trader should always remember that “the market is always there”, which means that one should protect his margin for his future trade. Having a clear target will eliminate the emotional trading in your trade. This situation had been persisting and intensified over the recent years. The high share index, the low price in gold price and silver are the result of such manipulation. Trader will notice that there is always some sort of taking out cut loss movement occur before price is going to make a big move in the opposite direction are clear evident of the price manipulation by the major player in the market. Read more about stop hunting on Investopedia. We used to depend on the economic data issued by various government department to plan our trade. Trader should be aware that these data are no more as accurate and reliable in the recent time. The present market situation is critical and it represent a good opportunity for those that have prepared for the volatile market movement ahead. Do your study, prepare yourself and this will be a once-in-a-lifetime opportunity for many traders. Good luck and enjoy your trading. I recently had the pleasure of speaking about trading Bitcoin and Cryptocurrencies at the first CryptoSG meet-up in Singapore, alongside 6 others speakers who covered various other topics about Bitcoin, Altcoins, and Blockchain technology. In this presentation, I introduced an approach to trading that (I hope) is not what your typical "trading course" or "technical analysis class" would teach, and shared a method that I believe is one of, if not the only way to be able to make sense the market with a complete picture. I shared some tips and overarching concepts that I feel are more important than just charts and indicators, and hopefully this will be able to shorten your learning curve and help you find a footing in the market without having to go through the same mistakes I made. It summarizes my last post, An Essential Beginner's Starter-Kit for your Journey into the Cryptocurrency Jungle that is Bitcoin & Altcoins Trading, while also covering some other key concepts spread throughout my blog. Why does this methodology of "market structure" and "emotional market crash cycle" work so well? If you think about it, the only common denominator between all markets is nothing other than the people trading them. Therefore I believe it stands to reason that human emotions and trader psychology play an immensely critical role in being able to understand how markets work. I'll just leave it at that so I don't spoil the rest of the video for you. Unfortunately, the first 5 minutes or so of the live talk got cut off due to technical issues, but I also recorded it into a webinar if you're interested to watch the complete presentation. Enjoy! If you just want to look at the slides, you can view or download the PDF of my presentation here. This presentation was merely an introduction and a very brief high-level overview of how to approach trading, where I highlighted a wide range of important things to look out for, but you probably still have a ton of more specific questions such as about how to get started, what to look out for on a chart, or how you can apply market structure and the emotional crash cycle into your trading strategy. It's impossible to condense 3-5 years of experience and knowledge into a single book or a video which you can absorb and magically become a pro trader. There's no short cut to becoming a profitable trader, except through hard work and dedication, with time and experience. Don't be afraid of getting your hands dirty; learn by executing trades and making mistakes, because nobody ever learnt how to ride a bicycle by reading a book. With the right attitude to succeed, you too can eventually become a full-time trader and achieve your lifestyle or financial goals. However, know that it is not an easy road; never give up, keep learning and improving, and you will be rewarded in the end. In life as in trading, many things don't go according to plan. If you fall, get back up. To supplement what I covered in the presentation in my previous blog post, spend an hour to listen to this @chatwithtraders podcast with Michele Koenig who has over 14 years of trading experience and shares very relatable information about how to approach trading and start out as a beginner. Lastly, I just want to again highlight the last but most important point about trading, and that is risk management. This is probably the most undervalued component of trading especially for new traders, and is coincidentally why most people continue to blow up their accounts. If you play Texas Hold'em, or some other form of poker, you may have heard about 'bankroll management' and this concept applies to trading perfectly. Just like how professional poker players compete at a stake where their bankroll covers at least 30-100 buy-ins, professional traders typically risk no more than 1-2% per trade. You can have the best strategy and psychology. But without proper risk management, you'll blow your account up. One of the most common sayings on Wall Street is to let your winners run and cut your losses short. Many new traders make the mistake of being patient at the wrong time, and holding onto a losing trade longer than they should. This is caused by 2 things, firstly not having a trading plan in the first place and hence allowing emotions to eventually get the better of you, and trading without a stop loss. Stop-losses can help you to quickly cut losses when a trade goes south, as well as to protect your profits as you continue to ride the trend. Read more about how to use stop-losses effectively with these tutorials by @Rayner_Teo, an esteemed financial markets trader who's also from Singapore. With that, I hope I have opened up your mind with a unique view on how to approach the markets and changed your perception on what trading is all about, and also provided you with some practical information that can help you kick-start your trading journey. If you have any questions or feedback, feel free to leave them in the comments section, or reach out to me on Twitter, Telegram, and join the AlunaCrypto community on Telegram to discuss Bitcoin and Altcoin markets, share price and technical analysis, and keep up to date with the cryptocurrency market. Made a windfall during the recent cryptocurrency bull trend? Thinking of taking out your student loan to invest long term in Bitcoin, Ethereum, or some other alternative cryptocurrency and blockchain technology? Considering to quit your day job to be a full time cryptocurrency trader? Before you take an impulsive step that will drastically change your life for better or worse, take a step back and consider what this actually means, and if you have adequately planned for what you're getting yourself into. Are you sure that you are ready to play the hardest game in the world? Whether you're new to this whole trading game, or if you have some experience trading traditional markets but feel like crypto "is a totally different animal", this post is for you! If you're just like most new traders, you might not even understand what a "pip" is, or have no clue where to get started in reading and interpreting charts & candlesticks, and everything may look very foreign, daunting and overwhelming at first sight, but fret not! Cryptocurrency trading is no different from trading traditional markets, and in fact provides a more level playing field with relatively less "smart money" in the game today, and if I may say, "easier" to learn too. Whether or not you have any prior trading experience, this blog post aims to provide you with a starter-pack of essential knowledge and resources to help you learn trading, and to present a framework with which you can approach trading cryptocurrencies and the global markets at large. Trading and the world of Bitcoin and Altcoins may seem like trying to navigate through a dense jungle at first, but once you learn how to read your compass, have the right lenses on with which to view the markets through, and with the right attitude and propensity to keep trying & improving, you will quickly be able to develop an eye for the market and chart patterns, and begin to make sense of it all. No matter how you look at it, you became a trader the first day you bought your first Bitcoin, Ethereum, or altcoin, from someone else. Whether you're trading as a hobby, want to make this your full-time career, or simply just dipping your toes into the world of blockchains and cryptographic currencies, I believe it is prudent for you to at least arm yourself with basic trading techniques and price analysis frameworks, since trading is an integral aspect of owning cryptocurrencies that you cannot avoid whether you like it or not. Before we get into the tutorial proper, let's start off by looking at the markets and trading from a more abstract perspective. What's the one thing in common between all traded markets, be it stocks, bonds, commodities, or even cryptocurrencies? You may have guessed it, it's none other than the human beings trading it, and it is the emotions of these people that drive prices in the market. By this logic, we can argue that price is the collective representation of human emotions, and hence emotions and psychology are a critical puzzle piece and first step to understanding the rules of the game. We all have different styles, from the clothes we wear, to the time we sleep and wake, to the type of diets we have. Similarly with trading, we all have different risk appetite and propensity, schedules, preferences, portfolio size, and it essential for someone getting into trading to first figure out what type of trader you are, to form your own unique understanding of the market, your own perception of how to analyze the market, and your own framework on how to approach the market. With that said, though there are many different parameters you can tweak to develop your own style, there are several over-arching factors that you need to take care of regardless of your strategy or style, and the path that you have taken. The rest of this post will cover these key concepts, to give you a baseline for devising your own approach to trading cryptocurrencies like Bitcoin, Ethereum, Zcash, that you can bring along with you everywhere and trade any kind of market all the same. Understanding Yourself - What Type of Trader Are You? To begin, let's start with the simple yet effective 5W1H (except the 'when', which isn't all that relevant here) questioning technique, and dig in to understand ourselves better. First and foremost, WHY do you trade and WHAT do you want to achieve? Do you want to achieve financial freedom? Make some side income? Have an interest in the technology and wish to invest in it for the long term? Or do you wish to travel the world without being bound to a desk-job? Whatever the reason, make it clear to yourself and seek the advice and support of your family and friends. WHO are you? WHEN can you trade? Do you work a 9-5 job or are you a freelancer? Do you wake up at sunrise and go to bed at sundown, or are you a night owl? What is your schedule like? Do you have a family and kids, or are you single? Are you studying, or working? I'm sure you already know all this about yourself, but have you also considered these factors in developing your trading style? Only after figuring out the why, what, who, and when of your trading, can you be able to tailor your strategy to suit your circumstances. Are you a day trader, swing trader, or position trader? If you're working a full-time job and can't babysit your positions throughout the day, don't attempt to be a day trader trading 15m candles but focus on higher timeframes such as 6h, 12h or 1d candle charts instead! The art of trading is a simple yet seemingly complex task of putting together all the available bits and pieces of information to form a complete picture, in a world of incomplete information. On top of that, it involves 100s if not 1000s of hours of testing setups and strategies, finding your own way to make sense of it all, gaming probabilities, creating a plan and diligently following it, and most importantly, controlling your emotions and learning to apply proper risk management. Nobody said it was easy, but if you are ready to play the hardest game in the world, I'll try my best to hone you in the basics of the art of trading and to get you started on this adventure. For a primer on what to look out for as a beginner trader, spend some time to listen to this podcast where Jerry Robinson shares his journey, experience, and growth as a trader, and covers a wide range of diverse topics perfect for beginners, from the importance of having and following a trading plan/system, to the difference between the types of trading styles, to technical and fundamental analysis, emotions, the use of stop losses, and more. Perfect starter kit & trading intro. Day, swing, or position trader? Analyzing markets can involve the use of one of or a combination of numerous methods, such as fundamental analysis, technical analysis, quantitative analysis, based on retail order flow, based on news, or by following other people's tips or "insider information". Should be obvious but I'll just emphasize anyway, you should NOT be entering a trade based on a gut feeling, or on a coin toss, or worse still based on a "hot tip" from your uncle, colleague, or something you heard on the TV. Everyone has their own unique style, and the hard truth is that while some of them work, most don't. Moving forward, we'll break down trading into somewhat modular components and look at what determines a good trade, how you can start winning and be a profitable trader, look at some of the things you can do to avoid the trap of trading based off hot tips, and provide you with the necessary skills and knowledge to approach trading and conduct yourself in the market. What Determines a "Good Trade"? Generally, you should only take trades in the direction of the trend. i.e. only long / buy in a bull market and never try to short it until the trend has shown to reversed. Price should always be taken relative to something else. You are probably familiar with the BTC/USD pair, which represents the value of BTC in terms of USD, as well as the pairs with other fiat currencies. However, do not limit your perception, since price is relative, we can value BTC in terms of other commodities, such as gold (TradingView: BTC/Gold), or even big macs (Bitcoin Purchasing Power Index). Lastly, 'cheap' and 'expensive' are relative terms. A coin should not be seen as cheap just because it costs 1 satoshi, compared to Bitcoin for example that costs over $2000. Price should be analyzed in relation to it's market cap (supply * price), as well as the perceived value of the company, commodity, or cryptocurrency. Market timing is an often overlooked yet hugely critical component of a good trade. As some traders would say, "when it comes to trading, timing is everything." There's no 'good' price without a 'good' timing. You can buy at a 'high' price but at a 'perfect' timing and it'll be a good trade, but if your timing is 'bad', your 'good' price could quickly go against you and end up being a 'bad' or losing trade. 4. Don't chase the market! To chase or not to chase, that is the question. Well, not really. It is a no brainer to know that chasing price is a sure way to increase your risk, decrease your profit potential and, in time, probably blow your account. Here are 20 points to always keep in mind about the markets, trends, and prices, to remind yourself not to chase prices: Trading Success - How To Avoid Chasing Stocks. How To Win At Trading? 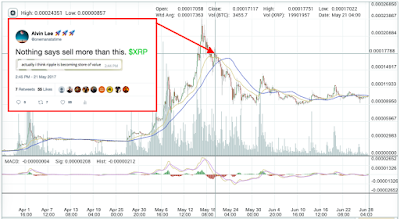 If you made some good profits during this recent bull run, now is the perfect time you learn to keep it, and fast. Not about how much you make. It's about how much you keep. What most new traders might find perplexing at first is that you don't have to win >50% of your trades to be profitable. There is an important concept called "risk-reward ratio" in trading, that can make you a profitable trader even if only 25% of your trades are winners, by taking only trades with rewards that outweigh the risks by >3x. i.e. you can make 3 losing trades at a loss of $1 each, only make 1 winning trade with a profit of $3, and still end up breaking even. So back to the question, how can we win? Perhaps to answer this question, we might get some clues by studying how people lose. People lose in two ways, by being impatient and getting into trades at the wrong time, or by being patient at the wrong time and holding on to a losing trade longer than they should. Don't be that guy. One of the most enduring sayings on Wall Street is "cut your losses short and let your winners run." Sage advice, but many investors still appear to do the opposite, selling stocks after a small gain only to watch them head higher, or holding a stock with a small loss, only to see it worsen. It may be a little counter-intuitive at first, but the path to winning lies simply in managing your losses. As the saying goes, "take care of your losses and your profits will take care of itself". Quora: How do I implement "Cut your losses and let your profits run"? For most professional traders, stop-losses are an integral part of any trading system, especially as you start to automate strategies. Be it the scalper looking to buy a high momentum breakout, or a position trader getting in at the accumulation phase, professional traders plan their exits (both take-profit, and stop-loss levels) before even entering a position. However, in crypto, and especially in the less mature markets, you may find it close to impossible in low liquidity markets to use stop-losses without running the risk of losing your entire accumulated position due to one careless wick. It is still advisable to use stop-losses especially when swing or day trading more liquid markets (e.g. 1000 btc daily volume or more), or at least have a plan and perhaps alerts set up to tell you when you should get out of your trade if you don't physically have a stop-loss order in place. Knowing exactly where to place your stop loss will take time & practice to hone, and there's no better way to learn than to actually get trading. Regardless, the concept of booking profits by moving stop-losses up, like a trailing stop-loss, should always be exercised to protect your profits during big trends and at the same time keep your draw-downs low. If trading is new to you, something basic like reading the chart might be a little confusing at first. However like I said, this is no rocket science. Learn more about the basics of reading a chart, meaning of trading terms, and other technical analysis tools and patterns to help in your analysis, with resources such as my other blog posts, investopedia.com or babypips.com. Trading analysis methods usually fall into two distinct categories; Technical Analysis (TA) or Fundamental Analysis (FA). You can find out more about the differences between fundamental and technical analysis by reading this Investopedia article here and this writeup on diffen.com. Fundamental Analysis refers to the study of the merits of the company behind a stock, typically by looking at a company's earnings, earnings per share, revenue, profit, growth, return on equity, and etc. Or in the case of cryptocurrencies, FA would include factors such as the project's technology and product, the strength of the development team, support from the community, and etc. Technical Analysis, on the other hand, involves the study of price action, looking for structure, cycles, patterns and setups based on price data and probabilities. TA is more of an art than a science. It is a science in that there are probabilities and quantitative data to analyze, but with people involved, it becomes a social science. As pointed out above, markets are traded by people, and people are irrational. Though chart patterns have probabilities of success and failure, it is ultimately decided by the market's participants and governed by their emotions, and hence TA is unable to 'predict' the precise price or timing of a move due to the multitude of factors that affect each other in a web, and where the action of one man can change everything. Most traders use a combination of both, in some manner not very different from this: Use FA to sort out the stocks that you'll actually put money into, while using TA predominantly to find entry point, to filter the stocks picked by FA, figure out which one is the right one to enter, right now. You may have a universe of great stocks, but knowing WHEN to buy them, is the key if you're a trader. Although FA gives you an idea of which stock is a good buy, it gives zero clue on the timing of entry for the trade. It is prudent to note that not only does FA not consider stop losses, it tends to go completely against stop loss strategies by encouraging one to add to a losing position, when price decreases while the fundamentals (e.g. P/E ratio) of the company remains the same. Whereas for TA, the concept of stop-losses and cutting losses short is imbued into most all strategies, and as mentioned is a key to preventing you from blowing your accounts. Fantastic (audio) book for beginners about how to approach trading and technical analysis. According to Wikipedia, a trading strategy is a fixed plan that is designed to achieve a profitable return by going long or short in markets. Would you drive a car on the road without understanding the road rules? ​I'm guessing you probably wouldn't, unless you wanted to dramatically increase the chances of a crash. So why is it that we still see so many new traders, rushing into the markets with no trading rules in place? Laziness, ignorance? Who knows, but one thing is certain... if you trade without any rule based trading strategies in place, then you are positioning yourself for disaster. It may be difficult to even know where to start at first, and it will take some time looking at charts, trying out various indicators, before you can get some idea of what may or may not work. From there, find some potentially profitable setups, and add parameters to your ruleset for entering and exiting a position. Besides the technical ruleset for the execution of trades itself, you should also seek to incorporate portfolio management considerations into your strategy. This could include things like your goals, a plan to manage risk, trade size, maintaining a trade journal, or even an exercise or diet regime to keep your mind sharp. By fixing your trading plan before taking any positions, and strictly following your plan and the rules you set in place, you should be able to better handle your emotions, as you trade based on quantifiable targets instead of relying on guesswork and being lost without any predetermined targets or exit plan. Stop focusing on the perfect entry. You may have heard the saying, that when your neighbour (or mother) starts buying, you know it's almost time to sell. This is true because trading is a zero-sum game, meaning that for every seller there is a buyer, for every winner there is a loser. In addition, information is more valuable the less people have it. The idea is that if "dumb money", or the mom-and-pop investor, is buying and yell that it is going to be the next best thing and will make him rich, it should be time for you to sell. Again, such emotional tells work in a market, based on our assumption that human emotions and trader psychology are drivers of prices, and critical components or puzzle pieces in understanding how this game works. Other than your neighbour or mom buying, other tell-tale signs include even things like tattoos. When people start getting overconfident or complacent, to the point where they get so deeply and emotionally attached to the stock/coin, you should take a step back and realize that euphoria is kicking in and the top may be near or already in. Examples would be people talking about buying lambos, mansions, yachts, or calling the investment a "store of value", "long term investment" after a 10x rise in price, or saying things like "i just need to hold for 1 year and i'll be rich". "I think ripple is becoming a store of value"
Contrarian investing is epitomized by Baron Rothchild's quote, "the time to buy is when there's blood in the streets." The name of the game here, keeping the emotional crash cycle in mind, would be to buy the fear, and sell the greed. Burn this chart into your mind, because it is the single most important concept you need to know about markets and trends, in order to get the big picture and make sense of it all. Watch the video below by @cryptopicasso who explains succinctly why and how this cycle is relevant to all of trading. If you like the video, you can subscribe to his webinar tutorial package for 0.5 BTC. Make sure to mention that you were referred by @onemanatatime, to enjoy $100 off your subscription fee. So who wants a glimpse of how to trade these coins ? To delve deep into trader psychology, listen to this interview with Mark Douglas, author of "Trading in the Zone", where he discusses trading psychology and risk management, as well as another podcast, How to master trading psychology with Brett Steenbarger by @chatwithtraders. Risk Management is undoubtedly the #1 most underrated trading philosophy, and also the most disregarded by new traders, who incidentally continue to blow up their accounts until they fix this. You can have the best strategy with insanely high gains, but if you are risking 20% or 50% on every trade, or if you cannot keep your draw-downs low, it is a risk management disaster and is not a good trading strategy! As a guide, in traditional markets, profitable ETFs and hedge funds look for draw-downs of no more than 7-10% per month, averaging about 10-20% or more profits per year. Rule number one of trading is you want to let your winners run, and cut your losses short. And back to our earlier point that if you manage your losses, your profits will take care of themselves. Sure, crypto is a different animal altogether, and your profits could be in the 100s or 1000s of %, but if you don't cut your losses to aggressively protect your bottom line and drawdowns, it'll only be a matter of time before you blow your account. In terms of trade size management - never go all in on one trade! Set rules so that you risk only 2% (or 5%, or 10%, or more depending on your risk appetite) of your portfolio in a single trade. And lastly, don't overtrade! "Major mistake made by novice traders is their bet size is too large -- often they risk 5%, 10% or more of capital on an individual trade." If you manage your risk, your profits will take care of itself. If you don't, your parents will take care of you. Some platforms offer up to 100x or even 500x leverage. With margin trading, small moves in price in the wrong direction can wipe you account (Read: Margin Call) if you're overleveraged or trading too big a position than you can afford. Friendly piece of advice, don't use more than 10x leverage, or even 3x for that matter, especially if you are not familiar with Margin Trading! 1. Don't think you're better than anyone else, or that you know it all. Be humble! 2. Be open to new ideas that may not necessarily agree with yours. Be objective with all kinds of information, remove bias and emotions when analyzing a chart. "A true genius admits that he/she knows nothing." 3. Must have a passion to learn and to improve yourself. The name of the game is survival -- STAY ALIVE! The Bitcoin Mercantile Exchange (BitMEX) is a leading digital currency exchange platform that offers Derivatives, Futures, and Prediction contracts and markets for margin trading cryptocurrencies. BitMEX offers a variety of contract types, and all contracts are bought and paid out in Bitcoin. It is the only platform that offers a "Perpetual P2P Swap", a contract that trades like a future but never expires! BitMEX touts itself to be a provider of "The Next Generation of Bitcoin Derivatives", and quite rightfully so. The platform has been able to grow significantly, no doubt partly due to their ability to open traders up to various kinds of interesting derivative markets, and keeping their customers happy with transparency, open communication, having strong security in place, and most importantly, a highly advanced yet user-friendly trading platform. BitMEX offers 3 bitcoin markets, namely, Bitcoin/USD (XBT). Bitcoin/CNY (XBC), Bitcoin/JPY (XBJ), a variety of other alternative cryptocurrency markets, and even prediction markets. Alternative cryptocurrency markets include Zcash (ZEC), Ethereum (ETH), Ethereum Classic (ETC), Monero (XMR), Ripple (XRP), Augur (REP), Litecoin (LTC), Factom (FCT), Dash (DASH), as well as other derivative prediction markets such as the likelihood of Bitcoin ETF Approval (COIN). They also offer demo accounts for you to test trading strategies without risking any funds. How Does Margin Trading on BitMEX Work? Margin Trading refers to borrowing from the broker (trading platform) to either buy or sell a stock. Depending on which market, BitMEX offers a flexible leverage of up to 100x for Bitcoin markets and up to 33x for Altcoin markets. But that doesn't mean that you should use the maximum available leverage, and in fact, you shouldn't unless you really know what you are doing! My suggestion for the new traders here is to stick to a leverage of 5x or less, before moving to 10x or higher when you are more comfortable. The need for KYC/AML only arises when you need to deposit or withdraw FIAT currency from the exchange. Example, for Bitfinex, you can trade any market using your BTC deposits and withdraw Bitcoin perfectly fine without filling up any forms. You only need to get your account approved when you want to deposit/withdraw USD or Euro etc..
For BitMEX, like most Bitcoin and cryptocurrency exchanges, there is no need to go through KYC/AML document submission and approval process, and you can start trading immediately just by signing up and funding your account! MUST DO: 2FA on both exchange and email account. Once this is done, you should not be able to get compromised, except in rare cases such as sim-jacking. Highly suggest using Google Authenticator / Authy type of 2FA, instead of SMS 2FA which is susceptible to sim-jacking with some social engineering and one lazy telco service operator customer care assistant. MUST DO: Use strong passwords; minimum 20 characters with a mix of upper- and lower-case letters, numbers, and characters. Optional: Use a separate email address for Bitcoin and cryptocurrency only. Now that we've got that out of the way, lets dive straight into navigating around the BitMEX exchange trading dashboard. Below is the landing page you'll see upon logging into your BitMEX account. Right at the top, you can find the ticker symbols of all the available markets. Clicking on the symbols on the left will toggle between showing the market data of the relevant market, namely current trading price and 24h % gain/loss. You can find a row of markets and their associated tickers in this section. Clicking on each of the markets will load the relevant market information as below. 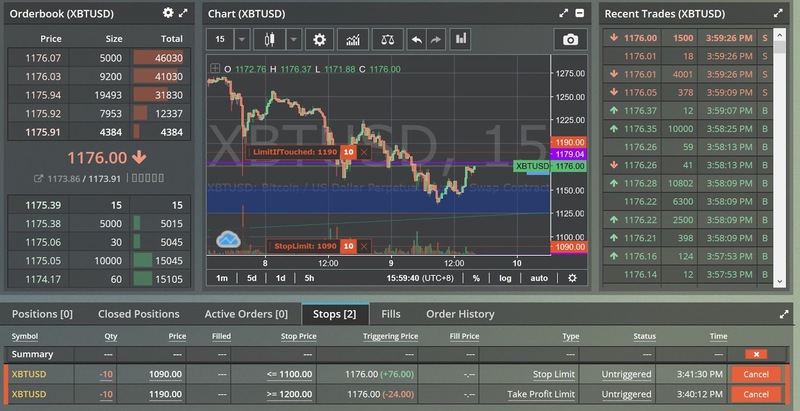 In this section, you can find the charts powered by tradingview.com, the order book, and recent trade history. The market that is shown here is the market is chosen in the "Market Selection" section. Here you will be able to see information about the contract or market that is chosen in the "Market Selection" section. You can view your balance at the top right. Alternatively, your available trading balance is also shown on the left side under the "Place Order" section. You may access your account information by clicking on your username at the top right, where you can change your currency denomination display, color theme, dashboard layout, and access other account/security and site preference settings. Alternatively, you can also click on "Account" in the dashboard tabs section to access your account settings. This is where you place your orders by inputting the quantity, price, and other parameters where required. Here you can see the overview of your open positions, including the number of contracts, entry price, Return on Equity (ROE), liquidation price, and leverage used. You are also able to adjust the leverage used in your open position. Active orders and open positions will appear in this section. It also shows a history of your orders and fills. 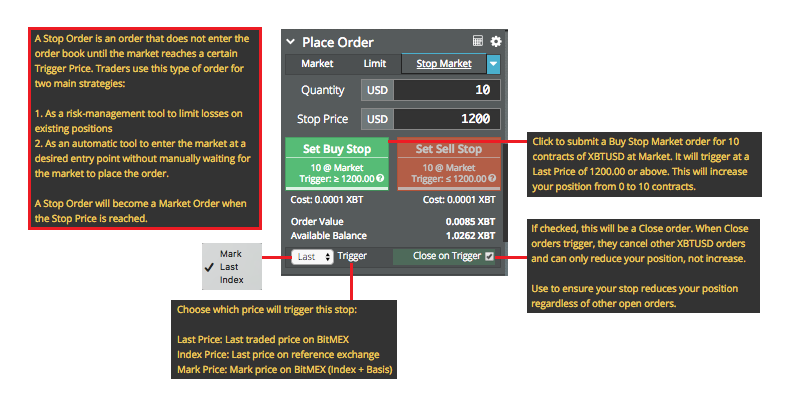 Now that you are familiar with how to navigate BitMEX's platform, let's move on to the various order types, placing an order, and get to the actual trading proper! Click on the image below to view it in full size. 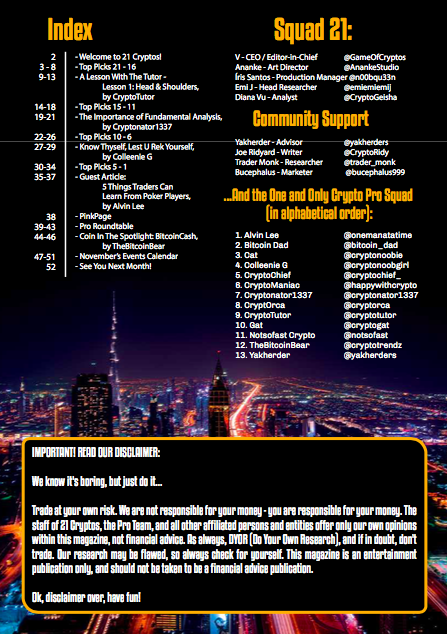 Let's go into more detail for each order type below. Market and Limit orders are the most common types of orders used by traders to enter into a trade/position. These orders are immediately entered into the order book once opened. Straightforward. Buys/sells at the nearest available price. After clicking Buy or Sell, there will be a confirmation page, where you can adjust your desired leverage for the trade. Next most commonly used order would be the Limit Order, which basically allows you to place a buy/sell at your desired price. Similarly, there is a confirmation page where you adjust your desired leverage for the trade. Stop orders, unlike market or limit orders, do not appear on the order book immediately upon opening. 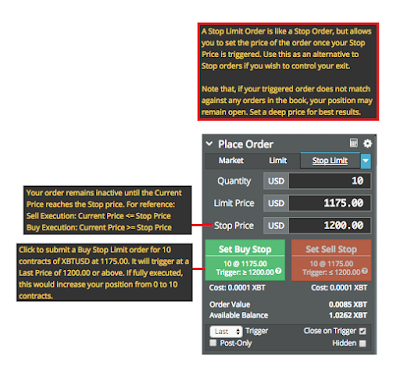 These orders are associated with a trigger price, or "stop price" in the case of BitMEX, whereby your order is only entered into the order book after the stop price is hit. As I shared in my last post about Bitfinex, stop orders are usually used as "stop losses" to get out of a bad trade, but are also extremely effective in buying into breakouts. To read more about how buy breakouts with stop orders and let your winners ride, check out this post about margin trading. A Stop Market Order is a market order that is triggered (opens) when your stop price is hit. For example, if today's BTC price is $1150, and you place a stop market buy order at $1200, your position will not trigger if price trades anywhere below $1199. Once a trade occurs on the market at $1200, your stop market buy order will trigger and a market buy is made. In the same way that a market order differs from a limit order, a Stop Limit Order works in the same way as a Stop Market Order, except with an additional "limit price" parameter that is triggered only when your stop price is hit. Further to the example above, if you enter $1200 as the stop price, and $1175 as the limit price, and when a trade occurs on the market at $1200, a limit order at $1175 will be placed. Alternatively, if you enter $1200 as the stop price, and $1210 as the limit price, this will act almost like a market buy when your trade is triggered (unless there are not enough sells for your purchase quantity up to the limit price - in which case you need to increase the limit price or simply use a stop market order). Instead of setting a stop price, a Trailing Stop Order makes use of a "Trail Value" parameter to determine when a market order gets triggered. 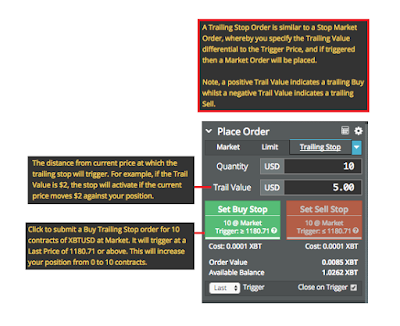 This "Trail Value" is calculated against the market's price at which you entered the position. For example, if BTC price is $1150 and I have an active buy position, and I open a Trailing Stop Order by entering a "Trail Value" of $5, my active buy position will close when price goes to $1145. Whereas if BTC price is $1200, opening the same trailing stop order will close my active buy position when price goes to $1195. Take Profit Orders, as the name suggests, enables you to set a target price on an existing open position to close it and "take profit". This can be done in the form of a market order or limit order. It simply works in the same way as placing a limit order in the opposite direction of your active position (i.e. 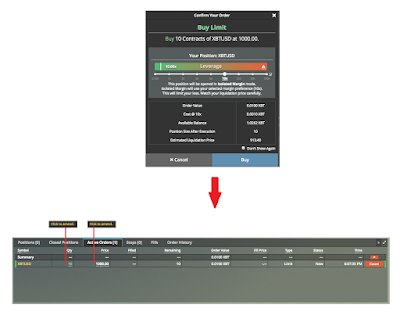 placing a limit sell order if you have an active buy position). Interestingly, just like using a stop to buy a breakout, this order type can also be used to set an entry point for a new position. But unlike a stop order, triggers are set in the opposite direction. To use it in this way, untick the "Close on Trigger" option as this is for closing orders only and will automatically cancel any orders if used to enter/open a position. 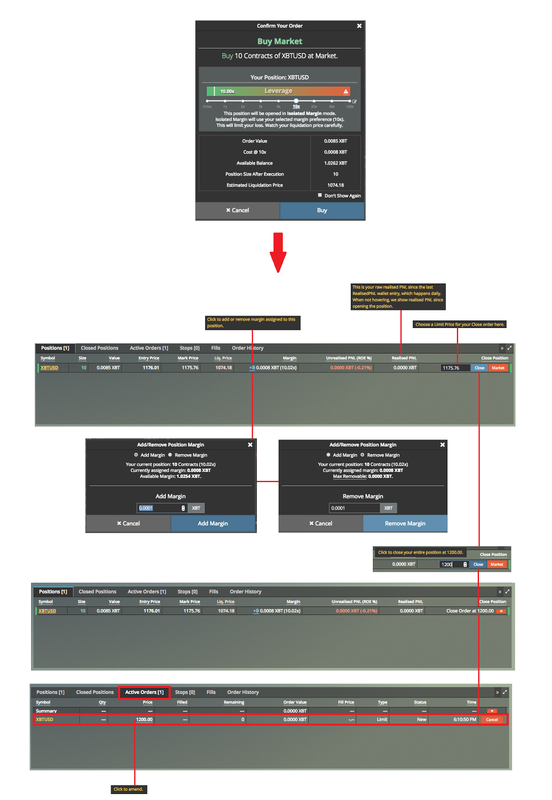 See below for a closer look at the Take Profit Market Order and Take Profit Limit Order. Upon placing your order or if you have any open positions, you can view and manage them in the middle bottom section of the trading dashboard. You can also view your order history, fills, and closed positions in this section. Once you place a limit order (and it doesn't immediately trigger), they will appear in this "Active Orders" tab. You can edit the quantity and price while the order is still open, although you can't change a buy into a sell. Stop orders and take profit orders will appear in the "Stops" tab. Once your active order triggers, or when you place a market order, they will appear here in "Positions". 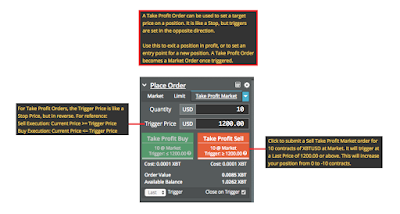 You are able to add/remove margin to your position, which changes the liquidation price of your position, as well as to easily place a limit or market order to close your position instead of having to place the order through the "Place Order" section. If you want to change your leverage used on a particular position, you can adjust it with the slider on the left side of your dashboard, just below the "Place Order" section. Active stop orders and take profit orders will appear here in the "Stops" tab. 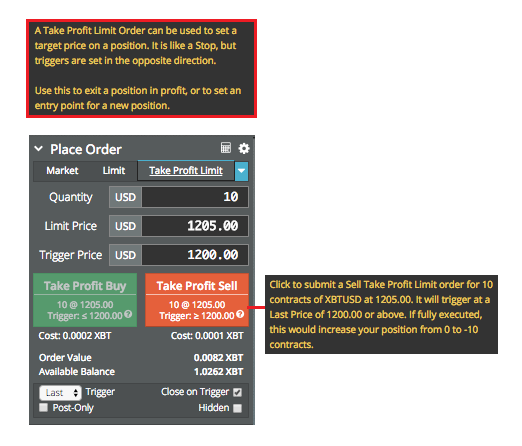 You can also edit some parameters, including the quantity, stop price, and limit price, as well as cancel the order. Lastly, you will be able to view all your order history, executed or not, in this "Order History" tab. You can then find all your filled order history in the "Fills" tab, and "Closed Positions" in the corresponding tab. Find below a snapshot of the funding, deposit, withdrawal, order execution, and swap fees. See it here: https://www.bitmex.com/app/fees. Read about the security measures in place on BitMEX from wallet and trading engine security, to system and communication security: https://www.bitmex.com/app/security. The platform offers a fully featured REST API and a powerful streaming WebSocket API, making available all market and user data and updates in real-time: https://www.bitmex.com/app/apiOverview. Bitmex has their own library of guides and tips on trading on their platform, which cover an extensive range of topics. So I tried to make this post more visual, and cover only what BitMEX themselves did not. They also have in-depth information about how their platform differs from competitors, for various parameters including liquidation events, contract loss mechanisms, max leverage, initial margin, maintenance margin, settlement mechanisms, minimum contract sizes, and many more! I hope that this post gives you a good overview of how to use BitMEX trading exchange platform to view markets, open orders, enter into positions, as well as teach you how to use each of the different order types. 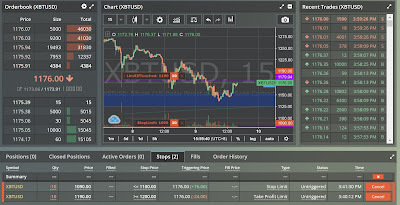 In my next post, I will prepare a similar tutorial for using 1Broker, which offers something different from Bitfinex or BitMEX, by having global markets such as Forex, Stocks, Indexes and Commodities available to traders. In addition, I also hope to share some tips on crafting your perfect trading strategy, and the importance of risk management and position sizing management. Stay tuned! If you have any suggestions or comments, please feel free to leave them below. Thank you for reading, and good luck trading!